It is a widely held view that the best way to improve intergenerational mobility is to provide more equitable distribution of human capital. Specifically, providing poor kids with the skills to succeed in the labour market allows them to escape the poverty of the families in which they grew up. For this reason, anti-poverty government programmes in the US have, for 50 years, focused on compensatory school programmes and access to early childhood programmes for poor children. They have also included ensuring more equitable distribution of school funding and school desegregation. Recent consideration has, however, suggested that achievement gaps in the US have been shifting in the wrong direction. The gaps, according to a widely cited study by Reardon (2011), have increased by some 75% across children born over the past four decades. This analysis, which considers achievement differences between children whose parental income is at the 90th percentile and at the 10th percentile, is interpreted by many as being a simple reflection of the widening distribution of income. And, similar to changes in the income distribution, the cause of expanding achievement gaps is seen in the significant gains for kids at the top of the income distribution. The newest analysis of this issue, however, reaches a different conclusion on the pattern of achievement gaps (Hanushek et al. 2019a, 2019b). Our study finds that achievement gaps over the past half century have neither grown nor shrunk; they have remained constant. The analysis behind this conclusion combines four separate student assessments that are each designed to track student performance over time on a consistent basis. The data come from two US government assessments (two versions of the National Assessment of Educational Progress, or NAEP: the Long Term NAEP and the Main NAEP) and two international assessments (Trends in International Mathematics and Science Study, or TIMSS, and the Programme for International Student Assessment, or PISA). Combined, these surveys provide 98 test-year-age observations of student achievement including performance in math, science, and reading for birth cohorts between 1954 and 2001. The corresponding survey data on student backgrounds provide information about parental education and various items in the home (from books to washing machines to cars). These data can be used to categorise families according to socioeconomic status. Using this distribution, the new study compares achievement for students in the top 10% of the socioeconomic status distribution and the bottom 10% (the ‘90-10 gap’) and for students in the top 25% and the bottom 25% (the ‘75-25 gap’). Figure 1 summarises this distribution by tracing a quadratic trend in achievement gaps by birth cohort. At the top of the figure are the unconditional 90-10 and 75-25 gaps, i.e. the gaps without considering anything about student backgrounds. These top plots show a slight narrowing in the overall achievement distribution over this period. 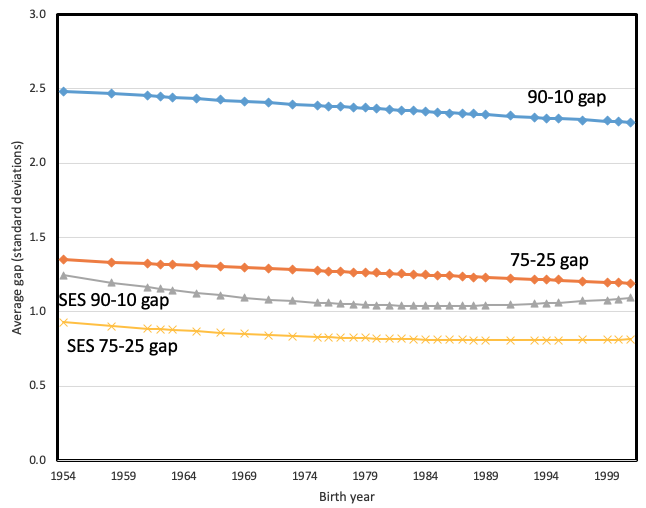 The gaps by socioeconomic status group are shown at the bottom of the figure. They are remarkably flat. This might be considered a good finding in that they are not exploding as some believe. On the other hand, they have not closed in the face of very substantial programmes that have been designed to shrink the gaps. A rising tide that lifts all boats? Of course, we might not be as concerned about the continuing achievement gaps if everybody were moving up, i.e. if a rising tide was lifting all boats. If one looks at the same longitudinal achievement data, one sees that achievement levels have risen substantially for students in lower secondary school, but over the past quarter century, this improvement has not translated into increased performance of 17-year-olds (Figure 2). In other words, achievement levels at the time when students are leaving for career and college have not improved. 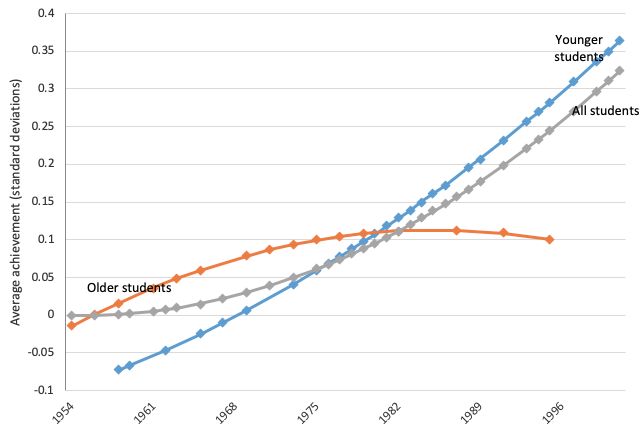 Thus, a rising tide is not counteracting the flat achievement gaps. How can we interpret this performance? The governmental policies pursued over the past 50 years have been substantial. At the federal level, compensatory funds for disadvantaged students have been some $500 billion since 1980, and funds for Head Start, the federal preschool programme for three- and four-year-olds, have amounted to some $250 billion. State programmes over the same period have been even larger in support of both the level and the distribution of spending. Have these just been offset by some other educational factors? It is difficult to conclude that families have worsened to the extent that it balances the efforts to lower the gaps. While there are more single-parent families, the education level of parents has improved, and family sizes have fallen. While we cannot disentangle the various inputs to education reliably, it is possible to conclude that new policies and new approaches seem called for if we wish to lessen the achievement gaps by socioeconomic status. If nothing changes, the prospects for improved intergenerational mobility appear limited.